The Dec. 2 Toy Drive was such a success that the Rangers will join forces with the Marines and Toys for Tots again on Dec. 12 and Dec. 14 to collect more toys from fans attending the team's home games on those nights. Fans bringing a toy to the games on Saturday, Dec. 12, and Monday, Dec. 14, may drop them off at collection tables in the mall area outside The Garden box office prior to the start of the game and into the first period. Fans donating toys will receive a pre-signed photo card featuring one of several Rangers Alumni (while supplies last). The 16h annual Rangers Holiday Toy Drive, which took place on Wednesday evening at The Pond at Bryant Park, has become such a tradition that even current Rangers players are starting to remember it from their own childhoods. Blueshirts forward Christopher Higgins, one of six Rangers on hand to sign autographs in exchange for donations of unwrapped toys for the U.S. Marine Corps’ Toys for Tots Program, got his first Toy Drive experience on Wednesday, but it was hardly the first time he had heard of the event that started when he was an 11-year-old in 1994. Rangers alternate captain Ryan Callahan was busy signing for hundreds of fans at the annual Rangers Toy Drive on Wednesday and had a chance to meet many of the people who cheer him at The Garden. Higgins, who grew up on Long Island in Smithtown, was actually an avid Montreal Canadiens fan as a kid, but he had plenty of friends who were avid Rangers fans, too. Joined by teammates Michal Rozsival, Ryan Callahan, Dan Girardi, Michael Del Zotto and Matt Gilroy, Higgins saw the excitement of the Toy Drive first-hand on Wednesday. More than 600 Rangers fans attended the event, and the Marines collected countless boxes of toys for underprivileged children to enjoy at Christmas. Also attending Wednesday were Rangers great Adam Graves, who helped start the Toy Drive during his playing days, and fellow Blueshirts alumni Brian Mullen and Ron Duguay. In addition to donating toys and getting autographs, the hundreds who turned out had an opportunity to skate, answer trivia questions for prizes, and participate in other Rangers activities. Mullen and Duguay spent much of their time on The Pond ice, skating with the fans, while Graves walked up and down the long line, personally thanking everyone for coming. Players signed autographs and posed for pictures in groups of two. Higgins and Rozsival were the first pair to sign, followed by Callahan and Girardi. Rookies Del Zotto and Gilroy finished off the evening in what will undoubtedly be the first of many such appearances during their Rangers careers. Players signed their own official Rangers photo cards, which were given to fans in exchange for their toy donations. Higgins said the Toy Drive was an event he really looked forward to after being traded to the Rangers from Montreal last summer. As he looked at the line of fans holding toys to donate, Graves noted how much it meant to him to see such a scene year after year. 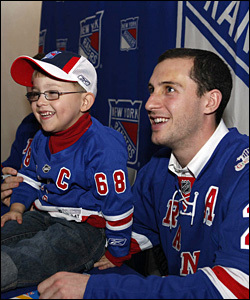 Higgins agreed that the Toy Drive was one more thing that made being a Ranger so special.